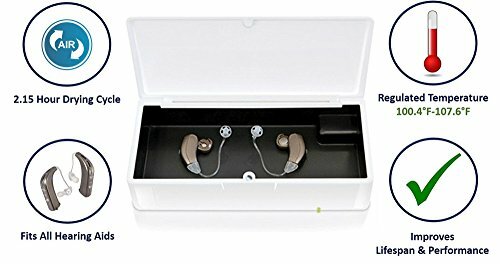 This electric hearing aid dryer is the perfect solution to keep you serene by Protecting your hearing aid investment through moisture removal that would otherwise cause damage and performance degradation. It's incredibly simple to use with a One-Touch operation switch that activates the 2.15 hour drying cycle. Simply put your hearing aids in the enclosed container before bed each night. Once the drying cycle is activated, an indication light will display on the front of the device, so you know when it's working. The enclosure is ventilated which prevents condensation build up inside the device. The drying temperature is also regulated and safe for all hearing instruments, powered by a standard U.S. AC-adapter. If you have any questions about this product by PerfectDry, contact us by completing and submitting the form below. If you are looking for a specif part number, please include it with your message.